Some big names are coming to Xbox Live next month. Xbox Live Gold subscribers will be receiving quite the eclectic selection of free games with August’s Games With Gold initiative. Thanks to the Xbox One’s backwards compatibility with Xbox 360 titles, that means four free games for next month. 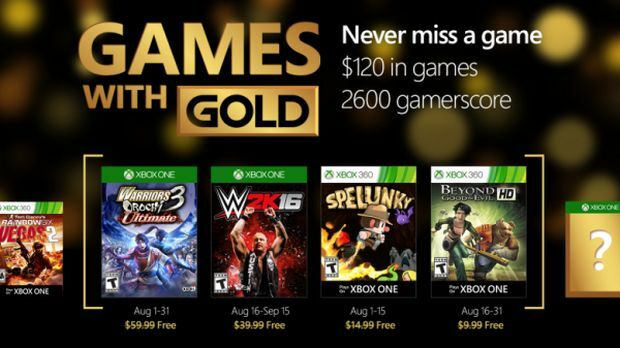 Xbox One titles include Warriors Orochi 3: Ultimate, which is free for the entire month, and WWE 2K16 which will be free from August 16th to September 15th. For Xbox 360 players, there’s Spelunky from August 1st to August 15th and Beyond Good & Evil HD which will be available from August 16 till August 31st. And honestly? You should be picking up Beyond Good & Evil HD. It’s just that good. Some of July’s free Games With Gold, like Tumblestone, are still available till August 15th so you might want to hurry up and download them now. What are your thoughts on August’s Free Games With Gold? Let us know in the comments below and stay tuned for more information.